Congrats! 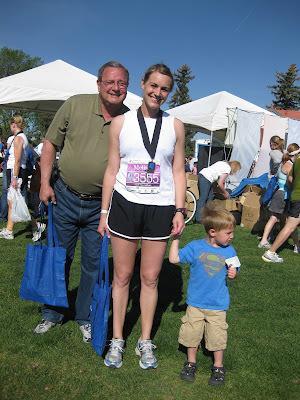 Let me know how you get those six pack abs because I want them too despite three marathons! I'm with you on #2...I can't stand gu!! You look so happy! Yay! Had you experimented with GU's prior to the race? I'm always pining for 6-pack abs...let me know if you figure a way to attain them. If you find recovery socks with monkeys, let me know. ZOMG, sister! Shortie2 is Superman?!1? Why didn't you tell us! Bet HE has 6-pack abs! Congrats on the half-marrry at such a killer pace! Great job! Which full marathon do you think you'll do? You've got the bug! I don't like Gu either. Great job! Can't wait to read the report!